Tis the season for all online bingo players to help those that are a little elderly or infirm who are housebound, to enjoy a few games of online bingo instead of venturing out in all the snowy weather. For most of the online bingo population enjoying the game of online bingo is easy because we understand the technology, but for some of the more senior members of the family it might be completely alien to them. Therefore a few hours of patience and simple instructions can open many doors for older people, and very soon they will be one of the growing army of silver surfers, playing online bingo with the best of them. It makes sense to start any older relations off with the easier bingo sites to use, so the likes of Foxy Bingo, Costa Bingo or Tombola Bingo are ideal for a first toe into the online bingo water. Make sure that if you are going to help some one who is a little long in the tooth that you explain things slowly and clearly as it is very easy for them to be put off with quick actions and too many instructions flung at them. 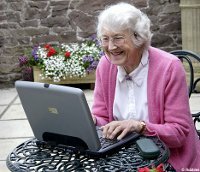 The next thing is to explain about the account procedures, we can all be a little shy of giving our bank details out willy-nilly so certainly one of the online bingo sites with secure transactions is an essential and will reassure Granny that she will not lose all her cash. All that is needed is a laptop, dongle and a bit of patience! It may seem a little patronising, and that is certainly not our intention, but we do understand for those that can’t get out to play the usual bingo games with their friends at the moment because of the weather it can be quite upsetting. If you have access to a laptop, a dongle with a bit of credit and a few hours to spare it is a lovely opportunity to connect with a family member that maybe you have never considered. Go on Crab a Granny and start playing some online bingo together, show her the sites and the chat rooms and you never know if she wins big she might just remember your kindness!